However, my question is: Can you create something you already have? I mean, Do you have it or you do not? Is it like a store where we can go and look through the clothes on sale to see if we find that we most like? I’m afraid not. First time I wrote about Personal Branding, I already told you that a personal brand is that which identifies us. The one that communicates the features that make us stand out, be relevant, and different. Our Personal branding is the footprint by which we will be remembered. Therefore, Personal Branding is something we already have inside of us. No something we can create from nothing. Personal branding, in any case, could be understood as the knowledge of who we are and the process that enable you to understand, promote and communicate the best version of ourselves. In order to understand a little better what is this about, let me go to the nineties. Year in which this concept emerged in the United States as Personal Branding. Also known as individual marketing, personal branding is the process that allows us to create a personal stamp to increase our personal and professional value. Nowadays, thanks to social networks it seems that like so many headlines dictate, Personal Branding is going to be more than “an advantage of today, a requirement of tomorrow”. Fact that brings us to hear, read and talk more and more about Personal Branding. However, Personal Branding is not something that is discovered from one day to another. It takes time, effort and commitment. I mean, knowing our personal branding involves knowing ourselves, discover our weaknesses and our strengths. Force us out of our comfort zone and grow both personally and professionally accordingly. Speaking personally, I would like to say that in my case I’m still in the process of becoming the best version of myself, and therefore, to find and consolidate my own personal branding. The most important thing when it comes to understanding the personal branding is understand it as the internal process of which it is. A process that requires much passion, humility, patience, effort, time and experiences to be consolidated. Beever, or even Andrés Pérez Ortega. They are people who have already found and consolidated their personal branding because they are passionate people who do what they do out of love and not interest. The same people who work every day for what they like or whom have a knack for relating to others, and therefore, infinite patience to achieve what they want most. Whether talking about personal branding, being an actress or performing realistic 3D drawing with chalk on the floor of a city. I have reached to read that our personal branding is how our digital ID. Well, if we consider that it is “the footprint” in the world in which we live, a world increasingly digitized. Yes, they are not so misguided. 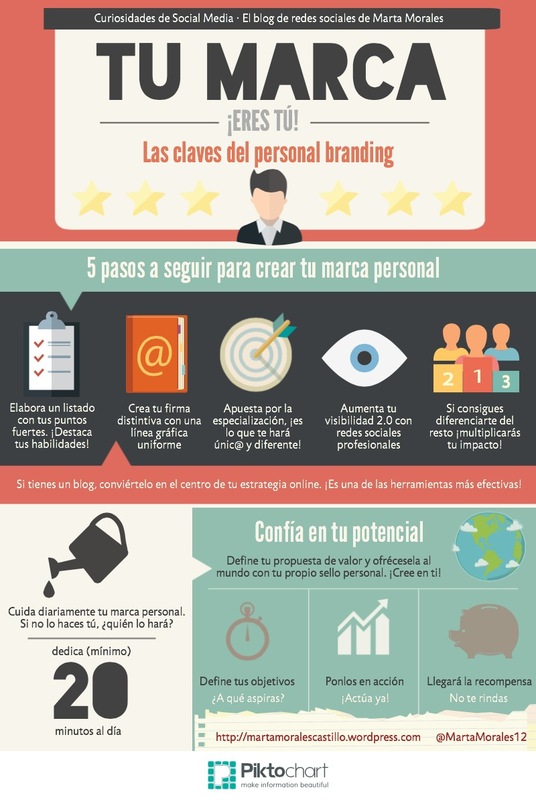 Then, and despite it is in spanish, I encourage you to see this infographic by Marta Morales Castillo about the “5 steps to create your personal branding”, (Although I will prefer to say, 5 steps to find your own “you”). Actually, I encourage you to undertake on the adventure of knowing yourself. Seek some goals, don’t be afraid to risk making you like most. Tell it to the world, and especially, enjoy being who you are and doing what you most passionate about. Everyone has something to offer to the world, and your personal branding is already by telling the world although you didn’t know it. Finally, and as a faithful follower of Andrés Pérez Ortega, I end this post with an abstract of his words. I hope they will inspire you as much as it inspired me. “At this point you will clear that your personal branding is the impact that you generate in your environment and that is the result of what you do. And what you don’t. But all these impacts are the result of personal choices that add or subtract. Personal Branding is a way of managing your life in a conscious way and taking your own decisions instead of letting others decide for you. Only those who really dare to discover themselves and those who bet for broke, are those who truly come to consolidate and convey a personal branding as strong as themselves. So, how is going?